When a £1M school improvement project got underway at Farr Primary and High schools in Sutherland, nine pupils in primaries 1 to 3 got the chance to roll their sleeves up and have-a-go at painting their new general purpose room. 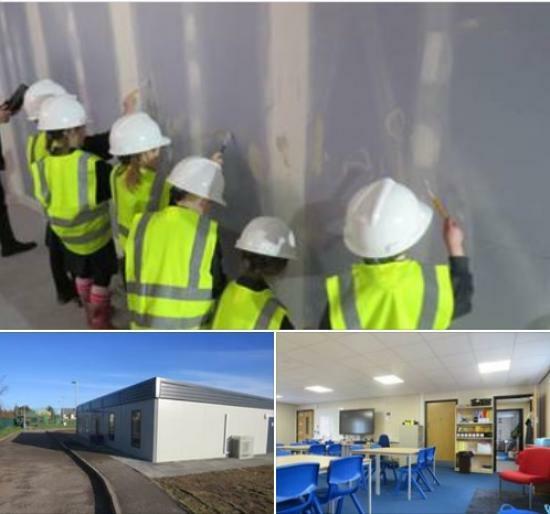 Councillor John Finlayson, Chair of The Highland Council's Care, Learning and Housing Committee said: "I am very pleased that contractor Morgan Sindall has recently completed capital programme works for Highland Council's school improvement programme at Farr in Sutherland. These works are part of the Council’s priority programme of refurbishment and renovation of Highland schools which is addressing the need for additional capacity in our schools." Darren Douglas, site manager for Morgan Sindall explained: "As part of our school engagement we were delighted to allow some Farr pupils the chance to be involved in construction skills. A huge amount of fun and enjoyment was had by all the pupils with their practical experience. “I would like to thank the staff and Head Teacher, Katherine Wood for their support and the school’s engagement throughout the works and we were delighted to receive a very ‘sweet’ message of thanks from the whole school in the form of a collage story board." The works at Farr Primary and High school included the refurbishment of various internal areas of the school and the external nursery area as well as the provision of a new double classroom modular unit. A new corridor was formed giving access to the new classroom. The general purpose room was completed giving privacy for additional teaching for pupils. The entrance hallway was reconfigured and the primary classrooms decorated. A new P4 - 7 class room was created and new furniture installed. New segregated toilets were built within the primary section of the school with new vanity units installed with colours chosen by the school. The science store was refurbished, and a new turf area was planted in the nursery garden, providing a natural soft surface for the children. A new modular building has added much needed classroom space to the High school where rooms are spacious and bright for the pupils and teachers.